Thursday night was the opening of our town’s new art center which featured an exhibit of art made from local wood assembled and sculpted by Dorothy Gill Barnes (see more about her here). My husband, Blair Davis, has assisted Dorothy for several years. He thinks of himself as a cabinet maker/woodturner/engineer and Dorothy insisted that he receive billing as an artist. He’s the bearded guy in the hat in this page of pictures I quickly assembled. Dorothy is the white-haired woman. One of Blair’s wood turned bowls with my polymer clay inlay was included in this show (here’s a brief in-process video). I was pleased that tonight two public gallery directors asked me about having polymer group shows in their spaces. If you haven’t been a polymer artist for long, you may not understand that it is music to my ears to be asked to set up a polymer show. No more explaining or defending polymer clay as art. It was a lovely night. Have a lovely weekend. Let the music to your ears resound and resonate in symbiotic symphony …all while having a lovely weekend! I am very much looking forward to seeing the collaborative piece that you and Blair are making for the Synergy2 exhibit at the conference in Baltimore this winter. Wonderful peek at the exhibit! Thank you, thank you, Cynthia for all you do that is so good for us! Great news, Cynthia. I’ll send you good musical vibes while I play for 6 hours+ of contra dancing tomorow. Congratulations Cynthia on yours and Blair’s beautiful work, the opening of the new art center and for all you do for our polymer clay world. How exciting to get the enthusiastic response of the galleries. I’m looking forward to seeing the bowl and you too. It really does feel like the worm has turned for polymer. Through the tireless efforts of all of us who set up our booths at craft shows, sell on ETSY, write or teach or blog about those crazy little blocks of color we love so much. And of course those working in a more visible way, like you Cynthia and Susan Lomuto and of course Elise. It hit me while reading all the blog entries about the ACC conference yesterday. The atmosphere of change in the arts is electric and we are smack dab in the middle of it. All of us essentially self-taught, starting out on kitchen tables the world over, redefining craft every day. so exciting – yeah us! Beautiful work Cynthia. I love how you and your husband collaborate together. I enjoyed watching the videos. I can see how it would be important to have that huge log centered on the lathe! As I watched the wood chips and sawdust gather on the floor, I could’nt help but think how clean my studio’s lookin’! I’ve often wondered, when I’ve seen your work or Bonnie Bishoff’s work, how one cures the clay on wood. Is your polymer clay somehow removed from the bowl, cured and glued in? And congratulations about the polymer group shows! I can’t install flash player and I’m so upset. I give thanks to those you who do make the tireless effort like Loretta said. You blaze the trail for the rest of us and thank you. Uplifting news indeed! And, by the way, it’s a pleasure to see your work. Alone, or in collaboration, more please. Wonderful, and congratulations. I also tire of the way polymer clay is not treated as a true art, when in fact it is and deserves the same respect as other forms of art. Kudos to all of you. Beautiful beautiful bowl. How wonderful to create with your life partner. Lucky lucky both of you. How wonderful it must be to be able to collaborate with your spouse in creating works of art! Very cool that you have that…and, wonderful news about the gallerys showing polymer works in the future; each time a gallery says ‘yes’, the “movement” takes a giant leap forward. Thanks for helping it along in so many ways, Cynthia..
Cynthia, I love seeing the collaboration of Wood and Polymer. 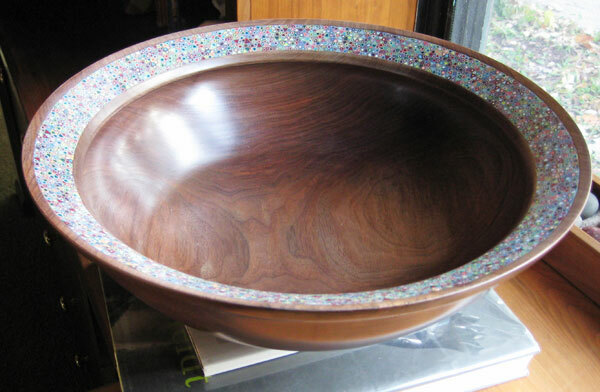 Blair’s wooden bowl forms are so refined and elegant, and your addition of the polymer clay just make them sing. I echo Jana, in saying how wonderful it must be to have a spouse you can create with. I too see a “Movement” a foot for the future of Polymer clay in Museums and Galleries. Thank you Cynthia for helping introduce the world to the wonders of polymer clay. Oh those wood turned bowls you make with Blair are amazing! Would love to see more of your work/talent. Thank you for sharing and congrats on the impressive art center! Cynthia, what lovely work! But I can’t help wondering how you cure that clay—wouldn’t a heat gun burn the wood? Do you just pop the whole thing in the oven?? Here’s a link to how I fire the clay. I tried the oven once…that was a big no go. What a wonderful article. I so enjoyed reading Blair’s blog and reading about Dorothy’s work. I use leaves and create polymer clay wearable art pieces from them so I can appreciate the deep love of trees. The bowl the two of you collaborated on is amazing, the polymer work reminds me of Klimt’s pieces. Absolutely lovely!!! What a great show and I’m so pleased it will still be there when I come to Columbus in November. I’m also pleased that I have a Blair Davis/ Cynthia Tinapple bowl to look at and enjoy each day as well as a small Dorothy Gill Barnes piece too. Can’t wait to see the show and you as well. Beautiful work. The mediums work so well together!